Taglines: The land you know. The story you don't. Has its moments but outside of Sam Raimi's strong directorial efforts and Rachel Weisz's fun and wickedly sassy performance, the movie plays more like a Star Wars prequel. Mildly entertaining look at the origins of the characters from 'The Wizard of Oz" has everything down pack. From great visuals to imaginative set pieces, this film has everything. 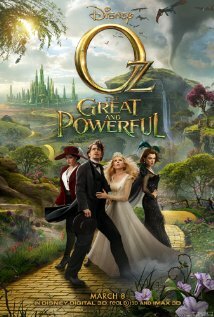 Its does not have however a single interesting character outside of the film's main villain and her good witch sister. Not to mention the fact that its script is as thin as a sheet of paper and the plot reeks of a Star Wars prequel but with out the light sabers. Its main hero Oscar Diggs (Played by James Franco) is not interesting at all and it does not help matters that Franco is miscast and while Oscar is supposed to be a bit of a conman with a heart; Franco comes across more as a degenerate deviant with his performance. While Franco is sputtering out of control performances wise, it falls on his co-stars to pick up his slack and one of them is Rachel Weisz, who plays the oldest witch sister Evanora, who rules Oz with a velvet iron glove. She is manipulative and cunning and in my mind the best thing about this film. While most of the things in this film are mostly kids stuff, Weisz infuses her character with a wickedly sassy seductive charm that elevates this film past most of its problems. Her showmanship with the material is greatly appreciated, especially when after a while; you are getting quite annoyed with most of the characters in this movie, especially the computer generated ones. Another actor who picks up Franco's slack is Michelle Williams, who is very charming in a good girl kind of way and is the only actor in the film who can hold the screen with Weisz performance wise. The movie could have worked much better if it just had Weisz and Williams as the leads but unfortunately, its not and we have to suffer though Franco trying to be charming in a squirmy kind of way and suffer though probably the movie's worse offense, which is the character of Theodora played by Mila Kunis, who redefines the word "Miscast". Theodora is supposed to be innocent in this film and gradually lose her innocence to become (Spoiler) the iconic "Wicked Witch of the West". Unfortunately, Mila comes across as interesting as a block of wood in this film and her transformation towards the climax ends up being more funny in a very bad sort of way than revealing. It does not help matters that Mila looks as disinterested in her character as the audience is and a better actor with more range could have brought more to it. All and all, it had its moments but its problems weight it down.